Until now, Amanda has been doing our Coffee Talk interviews. This month, we're turning the tables on her to find out her quilting point-of-view and to get a glimpse of what inspires her. I had only attend one guild meeting before Amanda joined. She came in with such energy and enthusiasm I immediately liked her. And I think we all instantly knew she'd be a great asset to the guild. I like that it's your turn to be interviewed, Amanda, and it's fun for me to be the one to do it. Thanks for making me not be all weird by interviewing myself...haha! Yes, that would be weird! 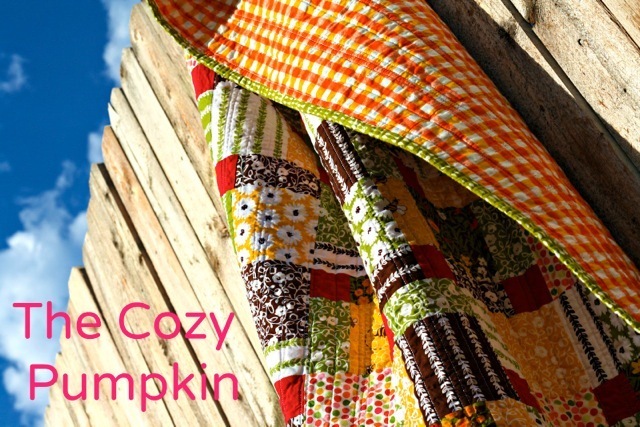 Okay, I'm already a follower of your blog so I'm just going to tell everyone that you blog at The Cozy Pumpkin. You recently had a beginner's sew-along that was really great. So, how did you get into sewing? What was YOUR beginner project? I had an introduction to sewing back in high school with my mom. We decided to make some shorts as our first project. The back of the legs were supposed to be just a hair shorter than the front, but we ended up sewing the fronts together and the backs together so one leg was shorter than the other. Oops! We had a good laugh, and I still used them for band practice. Yes, I was a band geek. And y'all wish you were as cool as us in high school! But, I didn't really enjoy the sewing process. Then, years later, my Mother-in-Law introduced me to the idea of quilting, bought me my first sewing machine, and I was hooked. I began sewing small projects shortly after my son was born. I was hooked for life! Wait a sec...I'm still laughing at the thought of you in wonky shorts marching around a football field... Ahem, I know you're son is pretty young, so that means you've been quilting for how long? While it was my Mother-in-Law's quilts that got me interested, it actually took me until I was pregnant with my daughter (9 months after my son was born) to decide I wanted to begin my first ever quilt. It was a rocky start. I had sciatic nerve issues and it made it impossible to baste my quilt. So my Mother-in-Law did a lot of the down on the floor work for me. Bless her heart. Sitting at the machine was excruciating, but my personality is to finish what I start and despite my discomfort, I finished that darned thing. I have no idea how I powered through that and still kept a love for the art of quilting, but I'm so glad I did. And that's my really long-winded way of saying I've been quilting for about two-and-a-half years. 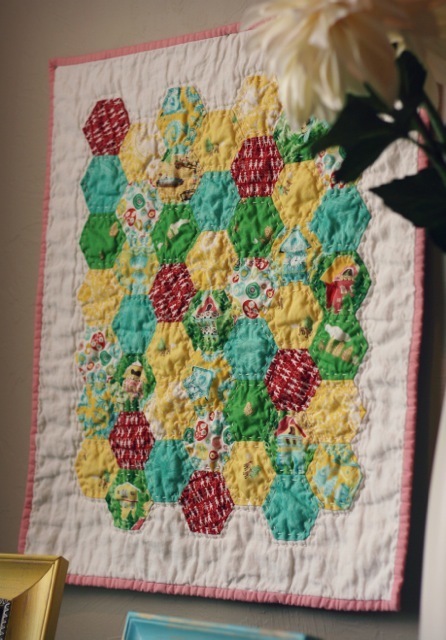 So, it's safe to say that your Mother-in-Law inspired you to get into quilting? Seeing as how I've mentioned her about 80 times already? I kid you not, she was so supportive of my interest and peaked my curiosity. Up to that point I'd only seen Amish quilts when my family would visit Lancaster, and hearing about their process made it sound so overwhelmingly tedious. But, when my Mother-in-Law explained how she went about making a quilt, I fell in love with the idea of creating something that provided comfort, warmth, and beauty in a home. And I think it's great that you both have something creative to share. So from seeing Amish quilts and being inspired by your Mother-in-Law, what drew you to modern quilting? I would say that the majority of the quilt patterns I make are very traditional in nature, but my modern aesthetic lies more in the fabric choices I make. I don't feel one way is better than the other. I will say that I like the freedom of modern quilting more. My Mother-in-Law lives by a very strict set of quilting rules that don't appeal to me. It seemed to deflate the fun for me a bit. But, once I started researching quilting online to learn more about the process, I found this whole world of young quilt bloggers who understood what I wanted to make, how I wanted to make it, and it opened up a door for me into the world of "modern quilting." but I'm so glad I did it. I love the vibrant colors! I've found so much information online to help me as well. It's amazing what is out there! Is there someone specific in the modern quilting world who inspires you? This is sort of a cop out answer, but I wouldn't say it's one particular individual. 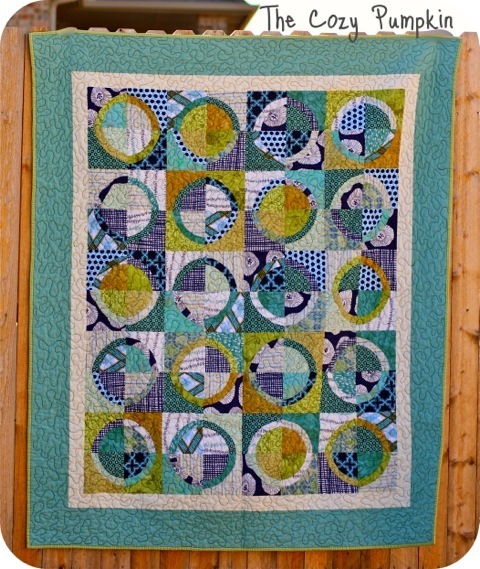 I think anyone that puts themselves out there with their style of "modern" quilting is an inspiration. The blogging ladies inspire me every time I open up their blogs. I may not enjoy a particular pattern, but I may love the use of color, or vice versa. The ladies in the Oklahoma City Modern Quilt Guild are always pushing me to try new things and inspiring me with their work. I love that about the modern quilting movement. People are out to inspire. I definitely have to agree with you about the quilt guild ladies. They ARE inspiring and encouraging. It's kind of a "there's enough creativity to go around" attitude and everyone is willing to share ideas. It's also interesting, in a group, to learn each other's fabric tastes. Is there a certain style or fabric designer you gravitate toward? I have a VERY wide range of fabrics that I like. It really depends on the project at hand. Some projects call for sweet vintage inspired prints and some are crying out for bold color. If I'm making something for my kids a novelty print is often in order. But, if I had to pick one person...I promise I won't totally cop out again...it would be Tula Pink. Not only does she have a unique color vision, but her style is subtle and bold all at the same time. There are so many layers to her prints that you can look at them over and over again and keep finding new little treasures. I also love that she's so out of the box. She doesn't let the mainstream design influence her vision. And, I also really adore Aneela Hoey. Not because I have to have her fabric, but I enjoy that I can look at her fabric and know that it is hers. I think it speaks to who she is as a designer and lover of textiles. "Ms. Red, If You Please" is a dresden doll quilt I made for my daughter's 2nd birthday...in 9 days! As you've told us, you have two young kids close in age. How/when/where do you get any sewing done?! And when do you get your ideas? I'm most productive when the kids are sleeping and my husband is occupied elsewhere! With little ones running around there just isn't time during most of my day to sit down. They won't let me! Darn kids always wanting to be entertained. I kid, I kid! Seriously though, I do wish I had more daylight hours to work. With that said, I am a night owl and I find that that's when I get the most sewing accomplished or when the most ideas arise. Shockingly, most of my ideas hit me in the shower just before bed. I try to draw them with my finger on the wet tile so I can remember them until I can write them on paper when I'm done. I think I drive my husband a bit batty when I run out of the room to jot my idea down before it leaves my brain. What quilt creation are you most proud of? Oh my gosh! About a week ago this would have been a really easy question to answer, but one of the quilts I'm working on completing right now is a real contender to replace it. But, since I can't show you that one, we'll stick with my original. It is, currently, "A Porthole With a View." I made it for my dad for Christmas last year. It was a battle to the finish with my old quilting machine, but I got it done. It was my first attempt at curved piecing, and the fabrics just screamed my dad. I even made a giant appliqué of an anchor on the back. He sent it back to me for the guild's quilt show, and it was so hard to pack it up and send it back again. But, I think part of what I love about it is that it is my dad's. 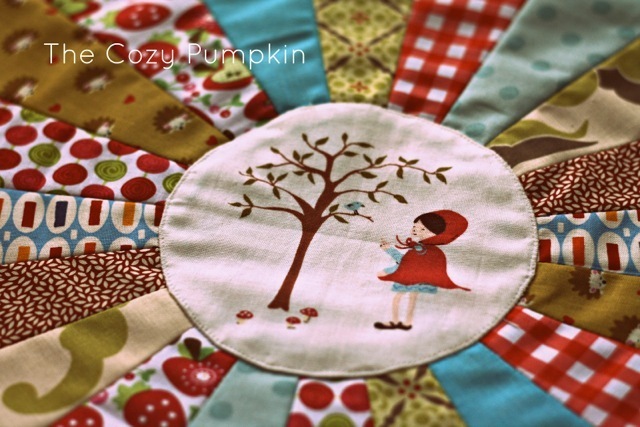 That's the magic in a quilt...the heart and soul you pour into creating it. "Porthole With a View" was a good lesson in persistence. I know your dad treasures it too. Is there a pattern or project you're hoping to tackle in the near future? I try not to pigeonhole myself too much. I like to work on a project that is inspiring to me. I want to improve at doing half-square triangles and I have a stack of patterns and books calling my name. I think I get too wrapped up sometimes in needing to create my own thing. I forget that sometimes the wheel need not always be reinvented, if you catch my drift. OH! And I want to work more on my Farmer's Wife quilt!!! Oh man, half-square triangles...love the look, but I totally need to improve that skill too. Your workmanship is really good. I mean, REALLY good. Please tell me you've had projects go wrong...? Ummm...not really a quilt project. I mean...I've had little flubs, but somehow the complicated things usually turn out fairly well for me. It's the easy things that I always seem to mess up. I once had a custom order for a nursery set. Full set...bumpers, crib skirt, curtains, quilt... I was making the crib skirt, literally sewing rectangles together and I kept messing up. I messed up so much that I finally tore the base fabric ripping out the seams. Ugh. It didn't help that it was late at night and I refused to stop. Sometimes, my tenacity is a good thing. Sometimes, it just makes me dig a deeper hole. That whole project was a disaster. I flubbed up the curtains too. Luckily, I was able to fix it all and she was none the wiser, but I was so flustered after that project. Oh good, I feel so much better now. It's always nice to know others have bad sewing days too. Let's go back to the Internet, specifically blogs. I follow a bunch. If you had to choose one blog to visit and also one book to buy, what would they be? I know I'm supposed to say Elizabeth Hartman's "newest" book here, right? And while I have both of her books, I just have to say that it was Allison over at Cluck Cluck Sew that got me hooked on this quilting without so many rules stuff. She was self-taught, just like I was, and she was the first person (other than my Mother-in-Law) that I reached out to for advice. 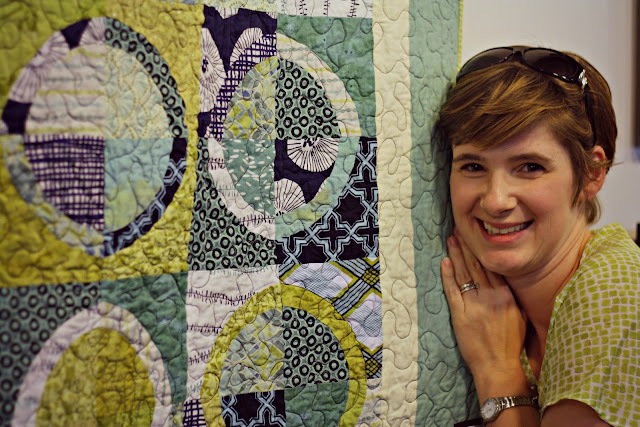 She is as sweet as can be and has lots of great ideas and patterns that are perfect for the novice quilter. What advice would you give to someone just discovering the world of modern quilting? Quilt with your heart and soul. If you're choosing the fabrics and projects that speak to you...every quilt you make will be lovely and uniquely yours. And that is a beautiful thing. "Sweet Home Chalet" made with English paper piecing and hand quilting. Indeed it is, Amanda. Creativity is a very personal thing, thanks for sharing your thoughts with us today. We can't wait to see what other beautiful projects you have in store!